The Devastation is Far From Over! Devastation Extended Edition gives you a vast array of new options to expand and enhance your BattleCOM game! 30 Alternative Costumes for your favourite heroes, each with a new Unique Ability. 2 Entirely new characters to fight as - Borneo and Juto, the mascots for War and Devastation. This is an Expansion. 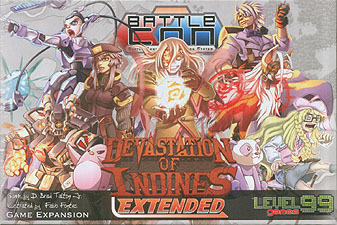 BattleCON: Devastation is required to play with the components in this box.